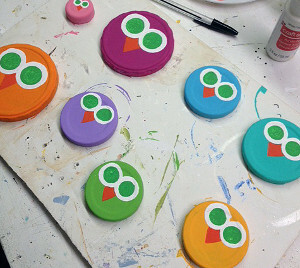 Hoo-Hoo is ready for one of the most adorable owl crafts for kids? 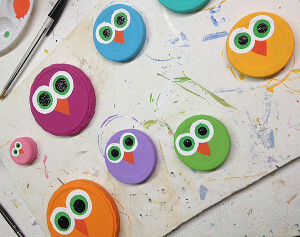 Jar Lid Owls look difficult because they're so precious, but with the help of sponge applicators, kids can make these animal crafts easily. Recycled crafts like these make you feel good about crafting as you help the earth while having fun. This art project serves as wonderful storage as well as darling decoration. Owls are all the rage, so include them in your trendy room. Wash and gently sand the jar lids to knock off any glossy finish. 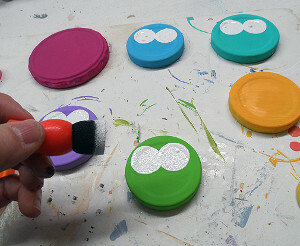 Paint the jar lids with bright colors. Paint a second coat if needed. 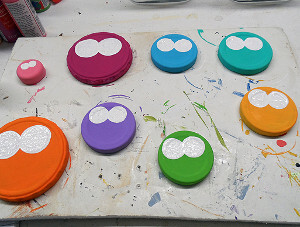 Dip a round sponge applicator into white paint and dot two eyes onto each lid. When white is dry, use a smaller round sponge applicator dipped in green paint to add the iris. When green is dry, use a smaller round sponge applicator (or a paintbrush handle) dipped in black paint to add the pupil. Use a toothpick to dot on a small dot of white onto the black pupil. Add a beak with dark orange paint. Use contrasting colors to paint on wings and foreheads. Find this project (and other amazing crafts) in 100 Craft Ideas for Kids: Art Project Ideas, Recycled Crafts for Kids, and More Fun Crafts! This project I really love!!! Very resourceful and makes use of recycled things. Here is another great project to do with your kids to help them create something with their own hands and very inexpensive to do. 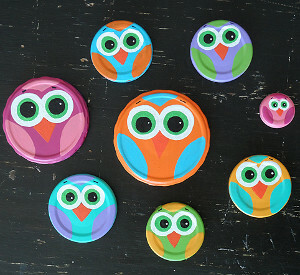 A little paint and some dollar store sponges some lids and a great imagination and you are on your way to make these cute Jar lid owls. Why not have a kids day with other moms and help them make some. These are just too cute and a fantastic, yet easy way to recycle lids!